The bluebird of happiness has landed on this fig. I’m not sure who Vern is, but after taking a couple of bites out of his namesake, I’d had to say, “Thank you, thank you very much.” (That was my Elvis voice.) The fig is a syrupy sweet bon bon of deliciousness, almost jam-like in its center. The skin is thin and beautifully mottled green and brownish purple. My Vern’s Brown Turkey fig tree is relatively young and in a pot. I’m still figuring out just where to plant the tree to foil the deer militia posted in my woods. They have a serious appetite for leafy greens. I live in Zone 8, and this fig tree looks promising. Oooh good to know. We took out a sickly street tree and replaced it with Vern’s Brown Turkey Fig. We’re still in Year 1 but already can see it’s going to grow well in its new home. It looks like it’s going to be multi-trunked: do you think that’s okay? Lelo, I’ll be making fig preserves soon and using fennel and ginger per your suggestion– thanks. I think things are tastier when they’re named for someone, or maybe the better discoveries tend to be named for someone because the creators are proud. Either way, here’s to Vern! Are the deer munching on your fig trees? Figs are often touted as being “deer proof”. Skip, I find deer are a lot like me in a buffet line, they have their favorites. Apple trees, tulips and roses top the list, and when those pickins are slim they head for the figs and lilies. Or who knows, they may hate the taste but just do it to yank my chain. I was lucky enough to find some fresh Black Mission figs and made a spot of jam. Mostly I just ate them for lunches with goat cheese and honey. Divine. Oh gosh! That’s the same variety I have. My tree is young too. I just bought it this year, although I did spring for one that was a few years old already. Thanks for showing me what I have to look forward to. Chris, what a fine recollection of Miss Mattie. It conjures up a wonderful vision, and certainly made me smile. Those look delightful! Tom, have you ever had a fig tree that ended up only giving you caprifigs? I am knew to the fig game and as the first harvest for our fig tree, the fruit turned out to be this weird, fluffy insides, unedible fruit. I did search online about this but it’s just so confusing. What I got out of info overload, however, is that I need to wait until the tree bears fruit again…and perhaps even again. If I get the same weird figs then it gets the axe. Any thoughts on caprifigs at all? Rowena, as far as I know true caprifigs need a wasp to pollinate them as they have male and female parts. No wasp, no figs. I’ve also read that a true caprifig only produces inedible figs. I really don’t know much about them as all of my figs seem to be self-fertile, no wasps necessary. You may want to buy a self-fertile tree or find a local tree that bears fruit regularly and see if you can get cuttings from it. (Fig cuttings root easily.) It will bear the fruit of the parent. When can I expect a fig that will grow in Minnesota??? Caducous (or Smyrna) figs need pollination to set crops. Without pollination the fruit drops before maturing. Caprifigs furnish the pollen needed. Examples are Marabout, Calimyrna (or Sari Lop), and Zidi. 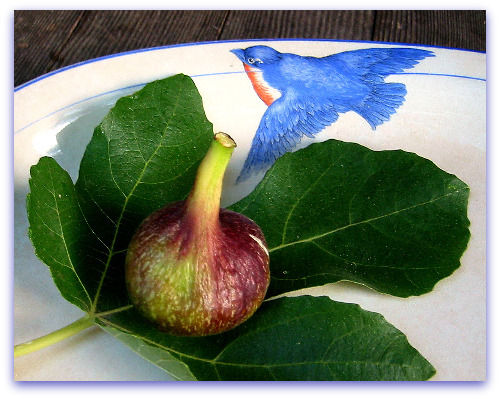 Persistent (or Common) figs do not need pollination to set crops and are the type home gardeners most commonly grow. Examples are Black Mission, Brown Turkey, Celeste, Brunswick and Adriatic. Intermediate Group (or San Pedro) figs do not need pollination to set a breba crop but do need it for the main crop (in some environments). Examples are King, Lampeira, and (of course) San Pedro. And Eileen, there’s a fig called Chicago Hardy, but perhaps Chicago is the Palm Springs of the Midwest. Tom!!!! You didn’t tell me you had bluebird plates! Do you know how much – well, never mind – the figs are delicious and beautifully photographed. Bluebird plates – who would have guessed… Dang. Hi Mif, just click on the SHARE/SAVE bar at the end of the post and an email icon will appear among other options. Click on the email envelope to continue to send the link via email. And miss you too! Hi Tom. After tasting all your other fig varieties, how does Vern’s BT rank with you? Nichole, Vern’s Black Turkey is good, especially if given a chance to really ripen. I’ve only had a few so far on the tree, and so I’m transplanting it. The spot I chose was a less than stellar site for a fig tree. It wants more sun, as much as I can give it. The tree is doing so-so; I think I need to add supplemental water with our now super dry summers, and prune it more heavily to encourage growth. I have mine in a large pot right now, grown from a small start. When is the best time to plant it in a permanent spot? I was thinking November…? I live in Portland, OR. Thanks! Rebecca, I’d say September onward is a great time to plant your fig, as its roots will establish nicely in the cool and wet of autumn in the Northwest. If you do it now, keep the tree well watered until our rains return.